I love doing fun shots of the bride and her bridesmaids, the groom and his groomsmen and the entire bridal party together. The days of lining up the bridal party like a ‘firing squad" are gone (though some very old-fashioned or uncreative photographers still do just that). These days I find that most of my wedding clients want a candid, casual, fun style of wedding photography...something that captures their true personalities.This image was created right in front of the house that the bride grew up in. Her BFF’s grabbed her cathedral length bridal veil and the girls set out for a stroll through her neighborhood just prior to leaving for church where her groom would see her for the first time. The girls enjoyed taking this photograph as much as I enjoyed capturing it. I always tell my clients that they should carefully consider their photographer’s personality when making the choice of who will be entrusted with preserving their memories. You will be with your photographer on your wedding day longer than any other professional vendor. I’ll be with you from the time you are getting ready for the big day through to near the end of your wedding reception. I like to think that I add a lot of fun to my client’s wedding days and I think that it shows in a lot of the pictures I create for them. This one is a prime example.Long before the party started at their beautiful waterfront catering venue in Huntington township on the north shore of Long Island, the girls were having a blast with their friends, family and yes; even me, the wedding photographer. Make sure you do the same on your wedding day. Time is going to fly on the big day. 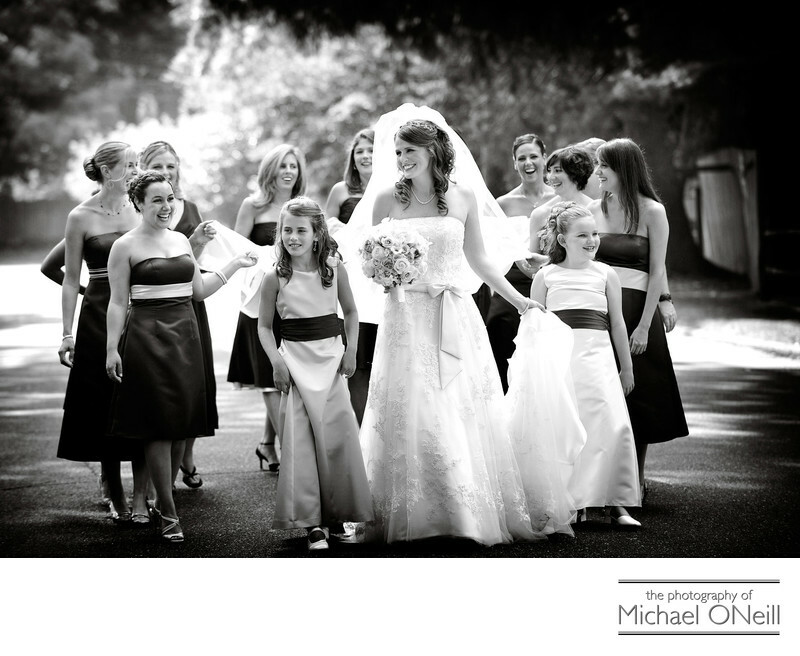 Choose a photographer that not only preserves your memories, but one who makes the process of doing so a joyous one.